The 25.6 metre motor yacht Sweet Mary, listed for sale by Steve Sprigg at Galati Yacht Sales, has been sold with Tony Lazzara at HMY introducing the buyer. 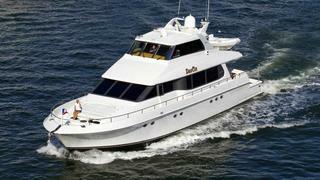 Built in GRP by US yard Lazzara Yachts, Sweet Mary was delivered in 2009 as a sky lounge model. Her interior in rich cherry wood veneers accommodates up to 10 guests in five cabins consisting of a full beam master suite, two VIP suites and two doubles, all with entertainment centres, flat screen televisions and en suite bathroom facilities. In addition, there are quarters for two crew. The main deck saloon has two settees upholstered in white leather plus end tables and an entertainment centre including a 42 inch LCD HD television screen. Forward is a dining area with seating for six guests while the galley, fully equipped with stainless steel appliances, has a raised dinette enabling six guests to enjoy breakfasts and casual meals. A notable feature is the abundant open space aboard, including full walk-around decks and an oversized aft deck featuring built in settees, a bar and a drop-down LCD television set, creating a wonderful ambiance for al fresco dining. The fully enclosed cabriolet sky lounge with an integrated hard top has a settee and table to port facing an entertainment centre including a 32 inch Sharp LCD television screen and leads out to the upper aft deck with more outdoor seating. Twin 1,650hp Caterpillar diesel engines give her a cruising speed of 24 knots and she is fitted with Trac digital fin zero speed stabilisers. Lying in Naples, Florida, Sweet Mary was asking $2,795,000.